I thought I'd take another crack at this fun listing article. Check out my last one posted three years ago! This is just some descriptions with quick commentary. Maybe you'll learn something or maybe you'll just be amused.. Enjoy! Althea: One of Iuz the Evil's top priestesses in the Boneheart. Between her and Halga, I can't recall which was the pretty one. I used to have fun playing them up in my comics. Belissica: Speaking of pretty, the Countess of Urnst. In my campaign, I cannot think of a more well-liked, well-to-do, comely human female in all of the Flanaess. Must be why one of my players tried so hard to court her! Ctenmiir: Ah that poor vampire trapped inside White Plume Mountain. Nowadays vampires get out in daylight, join clans, even raise families. How times change! Drawmij: My favorite aquatic-themed Greyhawk wizard (very specific I know). No wizard gets my creative juices going more than him. I immediately start thinking Cpt. Nemo, meets Jacques Cousteau meets Aquaman. Elayne Mystica: Hey more wizards! Elayne is an albino human who used to live beneath the Hellfurnace mountains, but now resides in Irongate. Check out what I've done with her. Fedroot: Good ol' Fedroot owns the Daggerarium in the Old City section of Greyhawk. I don't think there's a finer weaponsmith outside a dwarven forge than Fedroot. So says Mortellan! Galap Dreidel: Wicked archmage, creator of the Soul Gem and former resident of the Ghost Tower of Inverness. The module says he left northwest over the Selintan River and never came back. Very curious where he went off to since that was a millennia ago. Let's hope wherever he went, he at least changed his name. Hazen: Aged clerical ruler of Veluna. His artifact, the Crook of Rao is responsible for banishing like 99.9% of the demons on Oerth in a day. Of course nothing said they couldn't just come back...was his Crook a one-shot item? Immonara: Archdruid of Obad-hai. All I know about her is she leads a sect in the Adri Forest. I would've thought female druids would be into Ehlonna though. Druids are neutral folk though, so equality and all that. Jallarzi Sallavarian: Speaking of females breaking into men's fields. Jallarzi is to this day the only female member of the Circle of Eight (until Return of the Eight *cough*). As fair magic-users go she is up there with Belissica as well. Also, she had a cool pseudo-dragon pet before it was cool to have little dragon pets. Kermin Mind-Bender: Yeah yeah, another wizard. Kermin is one of my favorites though. I don't know much about Kermin from Gygax's novels, but he is a Boneheart advisor of Iuz in canon. Kermin however is 18th level which means in addition bending minds, he has Wish-level magic. This is a guy who really could be a BBEG on his own! Lareth the Beautiful: This evil cleric from the Temple of Elemental Evil is inexplicably more popular in Greyhawk lore than half the NPCs I've mentioned. Recurring villains are good like that though. He never rated in my campaign though. Hm, my mistake I guess. Murad: The Sultan of Zeif, and a 15th level fighter! It's hard to find high level fighters (still alive) in canon. I wonder what dangerous adventures the sultan undertook to get to that peak of skill. He sounds like a ruler who leads from the vanguard in battle. 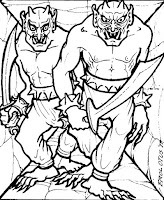 Nix and Nox: The Efreeti brothers from White Plume Mountain. Seen in one of my favorite illustrations by Erol Otus from 1E D&D. One evil genie is bad, but twins? Watch out! Org Nenshen: Leader of the Greyhawk Thieves Guild and best friend to former guildmember (no one is ever a former)Nerof Gasgol the mayor of the city. In this day and age of billionares and oligarchs in politics, a guy like Org makes perfect sense to me today. Pluffet Smedger the Elder: Esteemed professor from the University of Rel Mord and the author of the Guide to the World of Greyhawk. As Pluffet lives in the setting's future, the only thing we know for sure happens is that Rel Mord still stands. Querchard: Needless to say there isn't many good Q-named characters. Querchard is the Earl of Sterich. That is until post-wars when he vanished from Istivin leaving his wife Resbin in charge. One thing unique about Querchard is that in AD&D rules he is a multi-class fighter-thief-bard. None of those classes saved him from being kidnapped however. Ricard Damaris: Hey it's another fighter! While not as skilled (he is missing a finger) and important as Murad, Ricard does have a cool job, namely he runs the famous Green Dragon Inn in the City of Greyhawk. His boss (spoilers) is secretly another more powerful fight, the infamous Lord Robilar. Sevvord Redbeard: Speaking of warriors. Sevvord is the leader of the barbarian-adjacent Stonefists. There is probably no barbarian more brutal than this guy. I mean, his army is so tough they have annual try-outs! And I'm not 100% sure the losers live. Tang the Horrific: And while we're talking barbarians, Tang is one of those ridiculed but highly underrated NPCs. Who else has the moxie and charisma to try and raise a horde to take on Iuz? Too bad he never got his chance! Utavo the Wise: Okay so it isn't easy finding NPCs starting with a "U". Who knew? Last time I used Uhas and that's apparently the best until you get to Utavo the Wise (Living Greyhawk Journal #0) who is indeed a unique character in the Flanaess. He is a Tuov for starters, and second he is a former slave who now leads a sanctuary for other ex-Scarlet Brotherhood slaves in southern Sea Princes. Pretty cool! Vesparian Lafanel: Also called Vesper, this elf runs a humble pawn shop in the old City of Greyhawk. His actual job however with the Guild of Assassins. His seriousness and skill eventually led to his promotion to guildmaster (and thus Directing Oligarch) of the city, when his superior Turin Deathstalker left to fight Iuz in the north. Don't cross this elf. Waldorf: What? You've not heard of Waldorf?! Xavender: Xavender is the (other) Overking of the United Kingdom of Ahlissa (formerly the South Province). You want to see a pompous image of Xavender, check out the Living Greyhawk Gazetteer. At least he's not undead. Yolande: Queen of Celene. Belissica might be the epitome of beauty for human rulers, so I always assume Yolande is the peak of all elves. When I think of her how can I not picture Galadriel from Lord of the Rings? Zoltan: It's easy to pick rulers out for a notable people list. I've already done so several times. The last guy for the list is thus Zoltan, the beygraf of Ket. His claim to fame is opportunistically (and against counsel) attacking Bissel during the Greyhawk Wars, thus allying Ket with Iuz. Not popular with Bisselites or even his own people, Zoltan was eventually assassinated four years later. I'd like to think it Turin Deathstalker who was sent. That's all for now. More A-Z someday soon! Welcome again Greyhawkers. Today I continue my article series, "5 Reasons to Visit..." If you haven't read my seven previous installments, check this link to the Best of Greyhawkery and peruse those and many more good posts. The subject of the day is: 5 Reasons to Visit the Bright Desert! The Bright Desert is centrally located in the Flanaess and post-wars becomes a nation called the Bright Lands (after Rary the Traitor took the place over). There is a lot going on here besides the wizard Rary (check out Dungeon #98 for more info on the Bright Desert), let's dig in! 1. Shattados Palace. 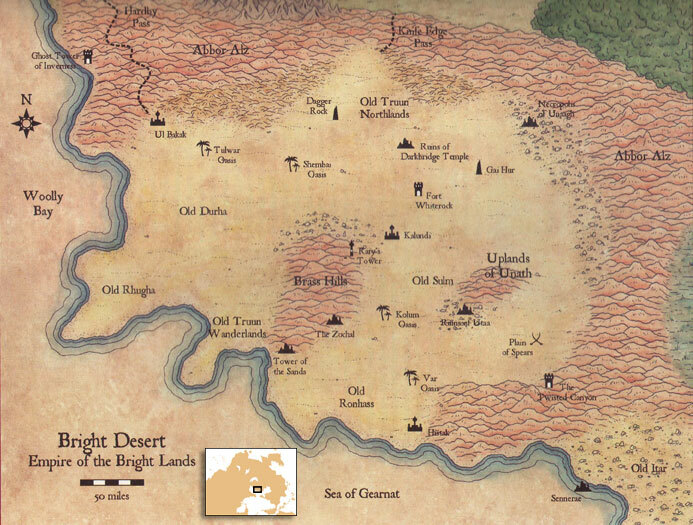 The Bright Desert was formerly the ancient (and evil) realm of Sulm before a cursed crown transformed it into a waste and the people turned into manscorpions. Shattados Palace is one of the few remaining ruins of this ancient time. Found in the indispensable 2E accessory Rary the Traitor, this location is where the last cursed king of Sulm still lurks with his treasures. The location of this place is interestingly not marked on a map which is great for DMs so they can send players on a Raiders of the Lost Ark style desert hunt. 2. Dagger Rock. Other ancient threats lair in the Bright Desert. Deep within the lonely spur of rock in the northern desert, sleeps the blue dragon Volte. Volte is a wyrm (dangerous indeed) who original hailed from the Stark Mounds to the west before being drove out over a century ago. Volte most likely wants to be left alone, but rumor says Rary has been entreating the wyrm to become his ally. A powerful archmage and a wyrm sounds like a deadly combination indeed. PCs will have to be quite experienced to take on this threat before it gets out of hand. 3. Ghost Tower of Inverness. The classic module C2: Ghost Tower of Inverness was first published in 1979 by Allen Hammack and is considered one of the 30 greatest adventures of all time. This is a standard dungeon (tower) crawl where heroes search for the ominous Soul Gem that once belonged to an ancient evil wizard (maybe why Rary was attracted to the region). Though technically in the Abbor Alz Hills, the Ghost Tower is quite close enough to the Bright Desert to get included in this series. This is a good low to mid-level module and can get players started on a campaign that involves the Bright Desert region. Look for a copy online or the PDF if you can! 4. Pits of Azak-Zil. 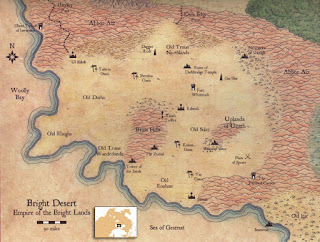 First mentioned in the seminal hardback Greyhawk Adventures, the Azak-Zil (Pureheart in dwarvish) is the site of a meteor crash on the fringe of the desert and hills. Many nations and clans vied to find and establish this mining colony. It was dwarves of Irongate who at last discovered the wealth of iron, platinum, mithril, adamantite and gold at this location. These dwarves became wealthy until one day the flow of ore stopped. What search parties have discovered since then is the pits are now overrun by undead of a strange sort, since they still work the mine and keep it to themselves. What has caused Azak-Zil to fall to undeath is left for PCs to discover. Perhaps they can clear the mines and re-establish operations for a new business interest. 5. The Mines. There is alot of cool adventure locations in the Bright Desert, so if I had one more to choose I guess I'll go with the Mines just cause they have an intriguing ruler, Father Eye. The Mines are a central interest of Archmage Rary because of its connection to the underdark. Scheming duergar dwarves now control and work in these old mines for their mysterious leader Father Eye. It doesn't take much imagination to deduce who or what Father Eye might be. Heroes looking for a good old fashioned mid-level dungeon-crawl would be well-served venturing into the Mines to take on Father Eye and his dastardly duergar. So there you go. The Bright Desert has so much untapped potential for adventure that I could do two of these articles. To reiterate for DMs, all you really need is Rary the Traitor, Ghost Tower of Inverness and maybe Dungeon #98 to do a full Bright Desert campaign. Much of this source material is in fact underdeveloped so it's also good ground for designing your dungeons or treasures. Have fun with the Bright Desert! 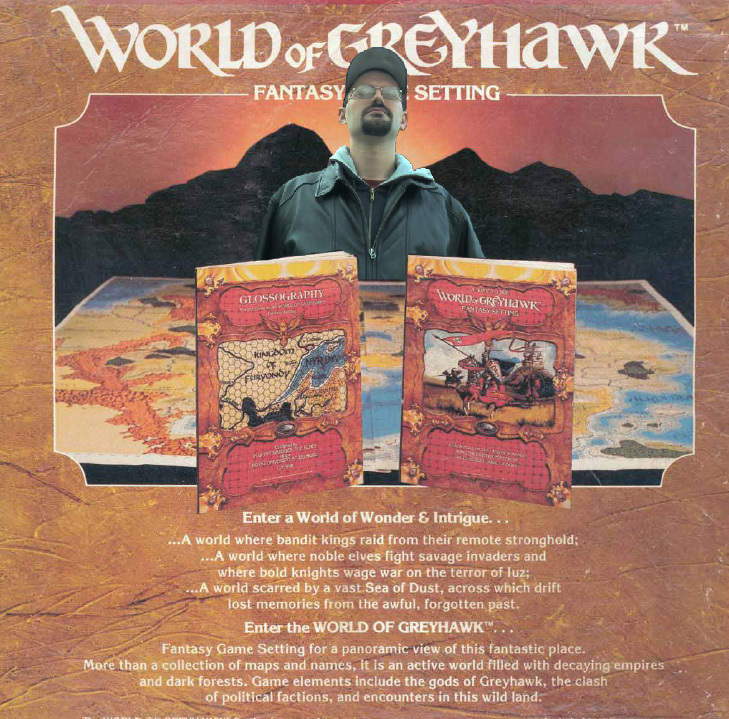 It's been a slow week Greyhawk-wise. Let's try a random list of 10 Places in Greyhawk I've Never Used. (In a campaign that is; mind you I've been playing Greyhawk for 35 years so I've had plenty of opportunities.) A couple caveats, one I'm not talking "Beyond the Flanaess" or any pseudo-Greyhawk that Gygax made post-TSR. 1. The Yeomanry. I don't think I've ever willingly set anything in this country, nor had a character come from here. Don't know why. Maybe too peaceful? Can't say for certain. 2. County of Ulek. Again, a most peaceful place in the Flanaess. A veritable "shire" of halfling delights. Haven't had any reason to cause trouble there in my campaigns. Odd! 3. Town of Fax. This town in the Wild Coast has a funny name. I probably avoided it for this reason. 4. Menowood. This woodland in the east is featured in the boxed set as a place to encounter werewolves. I'm not a big werewolf guy so I've probably subconsciously avoided Menowood. 5. Town of Gorna. The capital of the Grand Duchy of Geoff. I've probably had PCs pass through Geoff battling giants before but I don't think I've utilized the town before. This is a shame because I have a nice map of Gorna that Mike Schley did a few years back. 6. City of Sulward. The capital of the Lordship of the Isles. I've had NPCs hail from the lordship but I still haven't had any players set foot on these islands, much less the capital city. I hope to rectify that someday in my next Sea Princes campaign. 7. Yecha Hills. Again, I've probably had PCs travel past or through the hills, but I've never intentionally set anything in this part of the Tiger Nomad lands. A shame. 8. Town of Exag. This mysterious town in Perrenland got a royal write-up article in Dungeon Magazine #145. It's a place I ought to use if only because I love ancient history of Oerth stuff. 9. Axewood. This woodland is in the same neighborhood as the County of Ulek. Never used, but it has treants and elves. A possible fay paradise. Guess I just haven't had a need for that setting so far. 10. City of Lo Reltarma. Capital of the Lendore Isles/Spindrifts. Not sure. I know there's a few classic mods set on the isles that I've never ran, yet I've most likely used the Lendores indirectly because of the seafaring elves. I doubt however that I've ever visited this city in a game session since I can't recall a single fact about the place. Oh well! That was actually hard! 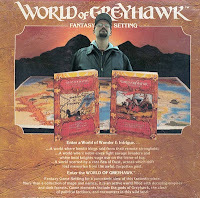 Some day soon we'll look at ten other Greyhawk things I've neglected. Some of you old school gamers who follow D&D news or social media probably have heard about the latest Unearthed Arcana document by head honcho Mike Mearls. The new idea that he's floated about is called "Greyhawk Initative" a variant system of tracking combat for 5E that he introduced at GaryCon 2017 (I was there but missed this bit). Initial reactions online have been muddled and confused. I have no desire to do a rules analysis or gripe about how this bad idea is attached to Greyhawk. Here is a couple places to help you out if you are interested. Welcome Greyhawk readers as I resurrect one of my article series, "5 Reasons to Visit..." If you haven't read my six previous installments, check this link to the Best of Greyhawkery and peruse those and many more of my finest work. Now onto the subject of the day: 5 Reasons to Visit Iuz! Well, not the deity himself of course, but more accurately the Land of Iuz proper (not the extended Empire controlled areas). All the entries in this survey are detailed in the indispensable 2E sourcebook Iuz the Evil by Carl Sargent. It's not that I'm biased but there really isn't a better source on this region of the setting. That said, if you do not own this book or PDF I highly advise you go and get it. The maps and content are a DM's dream. 1. Kendragund. The land of Iuz is easy to describe to someone who has never played Greyhawk, but has read or watched The Lord of the Rings; this place is Mordor. It is ruled by an exceedingly evil, omnipotent demigod whose armies are full of orcs and undead. The visuals are immediate and easy to comprehend for any one who plays D&D. First up is the orcish citadel of Kendragund in the Howling Hills. This is the seat of Iuz's orcish armies in the north, tales saying Iuz began his empire here subjugating the Urzun tribes and with the help of giants, erected the citadel in a day. Today, Kendragund holds a vast garrison of 5000 soldiers, scores of giants and undead warriors with dozens of priests and shamans to drive these forces at Iuz's will. This castle guards the Hills against Iuz's closest enemy, the Wolf Nomads that famously routed the Old One's invading forces at the Battle of Blackwater Bend back in 578 CY (Dragon #65). 2. Dorakaa. The capital city of Iuz's malevolent empire, Dorakaa is called The City of Skulls for good reason and is detailed further in the adventure of the same name. In this module the PCs are tasked to infiltrate and rescue a noble from the most evil place in the world. 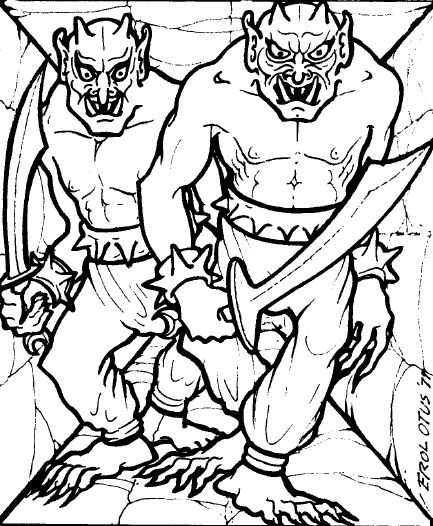 Dorakaa teems with demons, monsters, orcs, cultists and undead. The sky is literally under a perpetual dark cloud for miles around and the walls have magical defenses unlike any seen in the Flanaess. It doesn't get any worse than this city. Though Dorakaa is a slum for the most part, it still functions despite the horrors it contains. The city has twisted "Fiend Gardens", Agony Fields where public tortures are put on display, and the Jade Streets where depraved entertainments can be bought. There is artisan and slave quarters where skilled laborers still trade and toil for their masters and the masses of orc soldiery including Iuz's vaunted Legion of Black Death led by the fearsome cambion, General Sindol. Iuz's top henchmen, the Boneheart, have their own towers and residences here as well, every one just as well guarded and dangerous to visit as the central Palace of Iuz himself. The north wing of this impregnable abode contains the Blackspear Chamber, a permanent gate to the Abyss where Iuz continually draws forth his most fearsome servants. In the middle of the palace behind strong metal doors, is Iuz's throne, a grisly chair constructed from the rib cages of a hundred paladins and clerics of Good. Any PC who ventures to the City of Skulls had best be experienced and equipped with the best magic they can acquire. Attracting too much attention here can easily bring down an overwhelming opposition that no hero can fend off for very long. 3. Road of Skulls. Between the Howing Hills and the capital of Dorakaa is the worst testament to Iuz's reign in the north, the Road of Skulls. Running for 300 miles north-south, this "road" is an astonishing 60 yards wide albeit mostly barren earth. The main trait of his hellish road is at every interval is a pole topped by a skull of various humanoid races. Many of these skulls you see are imbued with magical properties, for example screaming when good-aligned creatures get within a 100 yards or various rays and harmful spells. Priests and wizards of Iuz, stationed in watch towers every six miles along the Road of Skulls, have control over these magical skulls using wands and staves, so all of this makes openly traveling in the land of Iuz a headache for adventurers. Worse yet, Iuz is now building similar Skull Trails east and west out of Dorakaa. Has there ever been a more foul engineering project in history? 4. Drenghuz. Not all the Howling Hills is controlled by Iuz or the Wolf Nomads. The caves of Drenghuz was once home to orcs (the same kind in Kendragund) but now is one of the most dangerous locations in the all the northern Flanaess. Deep below the earth a shadow dragon of uncertain age resides, though none are sure if it still lives or just slumbers. All the halls and caves surrounding this dragon are filled with hundreds of slow shadows, skulks and worse. Indeed, these denizens from the Plane of Shadow are impossible to control and are much more lethal than normal. 5. Icehand Plain. There is many strange and profane sites in the empire, like the Soul Husk Caverns, Devouring Bridge and more, but this last one is rare in that it is only relevant once a year. The Icehand Plain is an innocuous orc camp off the side of the Road of Skulls. On the last day of Sunsebb each year however, Iuz holds a grisly pep rally here. The leaders of every tribe and army unit along with many Boneheart henchmen and priests attend this mandatory rally. It is said Iuz himself sits upon a replica throne here and a gigantic hand made of black ice appears overhead. This hand points one by one at each of Iuz's subjects, as he divines their loyalty. Those who have traitorous thoughts or waver in their fanatic devotion are blasted into nothingness by a negative-energy ray. Needless to say this intimidates his commanders effectively. Who cares you say? The significance of Icehand Plain to players and DMs of course is that this is exactly the time and place of the year heroes know Iuz will be outside his palace defenses along with nearly his whole chain of command. It's the perfect opportunity for a hit job, that is if they can brave the icy hand that floats above and a multitude of high level threats all eager to please a paranoid demigod. Your PCs better be close to 20th level for this fight. Good luck! Welcome Grey Travelers! Today I muse over my latest reader poll, which villain should be sent to Ravenloft next? This is in reference to the fact the Arch-lich Vecna and a certain other lich from the Adri Forest named Azalin were both transplanted from Oerth to the Ravenloft setting due to the fact they are irredeemably evil. That's what the Dark Powers like to do, trap evil figures on the demiplane and torment them with hope of escape and an occasional band of heroes to antagonize. Next at 26% was Ivid the Undying. Ivid is quite mad, he is an immortal animus now and he lost his kingdom disappearing in the destruction of his capital after the wars. Perhaps Ivid and his demonic relic the Malachite Throne both get shunted to the Demiplane of Dread where it caters to his fantasies of ruling again over a large kingdom. That may not be enough though, Ivid will eventually go to war with his neighboring Dark Lords. Only a band of heroes will be able to keep him from turning Ravenloft into the Dark Great Kingdom. Speaking of tyrants, Rary the Traitor is third place with 22% of the vote. Rary is a troubled figure who is both super intelligent and a super powerful wizard. This puts him in the league as Vecna, Azalin or Iggwilv as to devising a way out of the demiplane. Rary tragically turned on his friends in the Circle of Eight, his own country and even his alignment, then moved to the Bright Desert to start his own kingdom. Those efforts haven't gone well however as his dreams of breaking the curse on the desert might be put on hold if the Mists take him away. Rary is wise so he probably wouldn't be a threat to PCs in Ravenloft, he'd probably blackmail and coerce them into doing his bidding in order to escape the demiplane. That's it for now. Did I miss any other good candidates? Let me know.